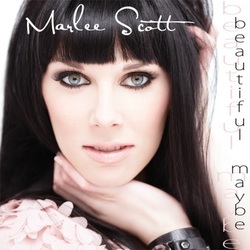 After listening to the CD Beautiful Maybe, I am a new fan of the dazzling and gorgeous Marlee Scott. Born in Richmond Hill, Ontario, at just six years old, she already knew she wanted to sing and it quickly became evident which direction her musical career would take when, upon arriving at a class to take flute lessons, she spotted a pink electric guitar sitting in the corner and headed straight for it. She then spent her childhood and early teenage years learning guitar and taking vocal lessons. She says, "Country music has always been a part of me," but as a teenager, she listened mostly to pop until, at the age of sixteen, fate intervened. "I remember riding around in the car with my friends one day and a song we didn't like came on the pop station, so we switched it over to the country station. Alabama’s 'Mountain Music' was playing. We liked the groove, so we left the radio tuned to country. I guess we just never changed it back!" "I Love Hating You" is about having a fall out with your best friend, over a boy, and getting revenge by loving to hate her. Whether she is writing and singing about life, love, breaking up, or simply dreaming, the whole album is uplifting. On the title track, "Beautiful Maybe", her voice captivates you from the very first stanza. "I see a little boy standing on his front porch / Wearing a superman cape / Hands on his hips, eyes on the sky / You can see it all over his face / it's a beautiful maybe / you know he's gotta try / it's a beautiful maybe / and baby it just might fly"
Not only a talented singer and song writer, Scott lauched her “Make It or Bake It” webisode cooking series in 2011. It has helped boost her Facebook following to more than 30,000 "likes". The humorous video clips feature some of her favorite food and drink recipes and gives you an insight to her playful personality. notes. “Lyrically, these songs represent who I am more accurately than anything I’ve ever written before. I hope people can hear and identify with that on this record.” To that I say, mission accomplished. I listened, I do, and I'm quite certain others will too. Marlee’s debut album on Big Ride Records came out in the U.S. and Canada in the spring.